When one thinks of Swiss chocolate the? 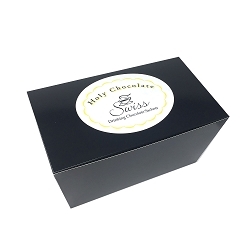 ?creamiest milk chocolate with a subtle chocolate presence comes to mind.? ?This is our? ?ultra-creamy,? ?velvety,? ?mild,? ?sophisticated,? ?sweet,? ?and flavorful? ?chocolate? ?for? ?traditional? ?Swiss? ?tastes.? ?But its modeled on the finest Swiss chocolates that aren’t usually imported into the? ?US. Unfortunately,? ?most people haven’t tried the very high end Swiss chocolates.? ?Even I hadn’t tried them until I met a very knowledgeable fellow who worked as a salesman for a Swiss food import company.? ?The very highest quality truffles have to be kept cool and will begin melting on your tongue.? ?They fill your mouth with a light and sophisticated chocolate taste mixed with the butter-creaminess of the cocoa butter and milk cream.? ?Words can hardly fully describe it because it just has to be experienced.? 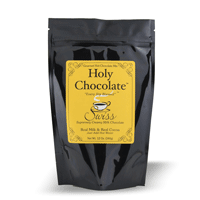 ?This is the experience we based the Swiss Ultra-Creamy milk cocoa on. I looked at the bag and saw the red cross on it and picked it up and smelled it.? ?It smelled so unique,? ?and so good I knew I was going to do something with it.? ?The cocoa color itself is a very pleasing dark reddish brown,? 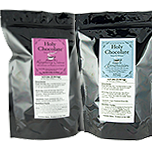 ?a different color than one sees in the French styled cocoa or even in American styled cocoa.? ?The smell was lightly musty like good dutched cocoas do,? ?the taste was sophisticated and had a certain quality that just said we were going to make an outstanding Swiss styled cocoa.? ?So I played with it for a while and came up with our super creamy masterpiece. During our first coffee meeting I found out he was not just an ordinary food salesman,? ?he was a former chef and at one time he had been on the SuperBowl team of chefs that assemble every year for all the official SuperBowl activities for the players,? ?owners and so on.? ?He was quite a character and a super good fellow with a lot of great stories and experiences.? ?Because of his chefs experience he had a unique knowledge of what things worked well and what chefs and dessert chefs really wanted.? ?In other words,? ?he was a real pro. Later I met my friend at the same coffee house we met at earlier and handed him a packet of what is now the Swiss.? ?He made the cup just by adding hot water.? ?After a few minutes to let it cool and thicken he picked up the cup and sipped it with a very surprised look on his face.? ?He said? “?It's like liquid coverture.? ?Its just like coverture? ?-? ?right out of the tap?”?. 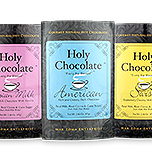 The truth is that all our cocoas that we use for our different Holy Chocolate varieties are used at the finest hotels,? ?restaurants,? ?and resorts.? ?Now you can serve it at your home or office. One serving has? ?1.66? ?oz.? ?of mix? (?almost? ?70%? ?more than some brands?) 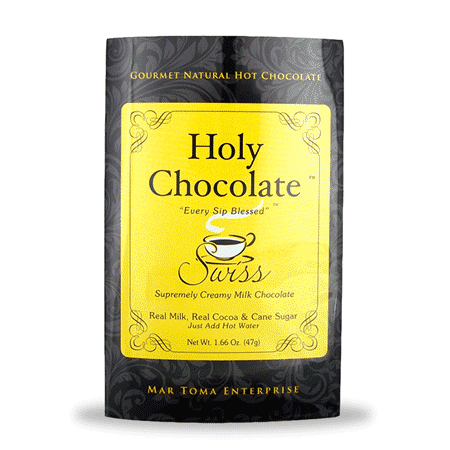 ?so that the milk is perfectly reconstituted and the chocolate taste is profound.? ?One wouldn't add more chocolate,? ?but you wouldn't take any away either.? ?You'll just want another one later. All our mixes,? ?only use real cocoa and real dried milk from pasture cows that are free of added rBST and antibiotics for an incomparable taste.? ?There are no artificial additives,? ?preservatives or fake milk mixes.? "?Heavenly things for a Heavenly people?!?...? ?As is perfectly right?!"